The Player is unique in that it’s the only object to accept input from the local player. 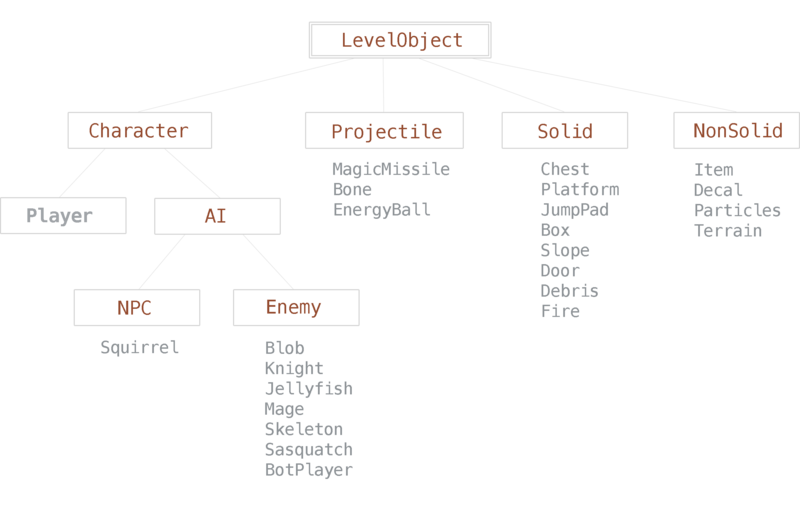 Being a Character, it has hp and maxHP as well as all the basics of LevelObject. This implementation of Player can walk, turn, jump, fall, land, crouch, stand up, hang from edges, aim in 8 directions, fire projectiles, swim, climb ladders, step up stairs, be given items, perform special animations like walking out a door and getting up from bed, and of course, die. This implementation of Player can attack enemies by jumping on top of them. Otherwise, if a contact occurs with an enemy, the player is damaged. The player’s other mode of attack is through firing projectiles. As the player transitions between levels, the current velocity, distance from the ground and current sprite frame are preserved to give the illusion of continuity. Actually, a whole new level is being created with a brand new player and the saved player state is re-applied. The tmx object property no-door (1 or true) can be set to not animate the player walking out a door at the start of the level. When playing single-player mode, the player begins with no abilities. The player can simply walk around. In this way, the platformer engine can be used to create an adventure genre game. missile enables the player to fire MagicMissile projectiles a short distance. longMissile fires magic missiles a long distance. jump enables the player to jump. hang enables the player to hang from edges. wallJump enables the player to jump when touching a wall. tallJump enables the player to jump higher. The names, descriptions and help text for the player’s abilities can be specified in the Assets/Strings.plist localization file. You can “hack” your save game to change the player’s currently enabled abilities. See Game.h. Each LevelObject must implement profileName so the appropriate profile can be loaded. We use Wizard here to load Assets/Profiles/Wizard.plist. This player’s index. In single player, this will always be zero. In multiplayer it will be a positive value below kMaxPlayers. Amount of experience points. Determines the players level. XP can be increased by obtaining tokens. Sets the Player’s properties with the given dictionary. Create fixtures attached to the physical body. Load the player’s previous physical state onEnter. The tick function is called to update the player’s movement, action, start animations, etc. Animate is called to update the player’s animations. Called when the player has input. Looks through the current physical contacts for objects which the Player might interact with. Example: if currently touching a Fire object, take damage. Handle being attacked by another object. Save / load the game. Give the player an item. Save a certain id to the player’s save game. These uniquely identify items, enemies and other objects. Attaching the id maxhealth03 to a chest and then calling the player’s setId will cause the chest to stay open the next time the level is loaded. A similar method can be used to keep enemies from respawing. Stop all animations and stand still. Set sprite frame for current aim position. Get offset for staff light. Return true if the player will animate the door.